In San Francisco to promote A Very Harold & Kumar 3D Christmas, the third of the outrageous and outrageously funny stoner comedies that he has starred in with Kal Penn, John Cho ponders just what it is that accounts for the success of the franchise. In the latest installment of the pals’ continuing adventures, the movie opens with that bromance on the skids. Kumar (Penn) is still a stoner and a screw-up, while Harold (Cho) is successful in business and in his marriage. The hunt for a Christmas tree good enough to please Harold’s disdainful father-in-law Mr. Perez (Danny Trejo) and perhaps earn Harold a little of the old man’s respect brings them together. Chaos reigns in a movie that could be the Yuletide cousin to Martin Scorsese’s After Hours as bad breaks and bizarre encounters dog them through the night. 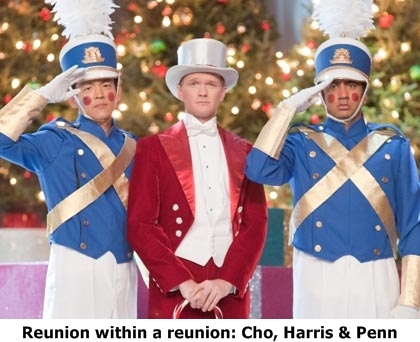 There is even a reunion within the reunion as Harold and Kumar wander into a theater and are thrust on stage to back up their old friend Neil Patrick Harris in a holiday extravaganza. The laughs in A Very Harold and Kumar 3D Christmas are strictly adults only, including a preposterous, ribald tribute to the family classic A Christmas Story. Despite that bawdy humor, the movie perfectly evokes the holiday spirit and Cho thinks he knows why.